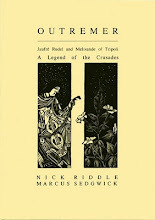 The legend of the troubadour Jaufré Rudel and Melisande of Tripoli: renditions, retellings, references and cameos. You know you've arrived when someone writes a scholarly paper about you (OK, that's open to discussion of course). And you know you're in tune with the Zeitgeist when the paper uses you to investigate an aspect of online culture. Jaufré Rudel's 'love from afar' and distant love via chat; a metaphorical approach (2006) by Pau Gerez Alum, Tutor for Medieval Romance Literature at the Open University of Catalonia. Love for an unknown person in a distant location has featured spectacularly throughout the history of literature. One of the emblematic authors who dealt with falling in love in such a blind fashion was the troubadour Jaufré Rudel, to the extent that he may be considered to be a literary paradigm. Get you, Jaufré, with your literary paradigm and everything. [...] it is impossible to escape a comparison with the type of amorous relationships that can be established via chat [...]. In addition to the mystery, related to a high component of idealisation, we believe that there are other comparative links from a metaphorical perspective, such as distance, the identity of the participants and the specific nature of the code used. Anyone who's tried online dating might find this rings a few bells.